The EUROCOM Panther 5SE is a 12 lbs, 6 kg Mobile Server equipped with 8 core, 16 thread Intel Xeon Processors, 4 TB of RAIDable Solid State storage and 32 GB of quad channel memory and is capable of running 32 virtual machines as your Cloud on the Go. “The Panther Mobile Server allows our customers to set up secure Cloud Computing capability on the go, with no risk of compromising intellectual property” Mark Bialic, Eurocom President. 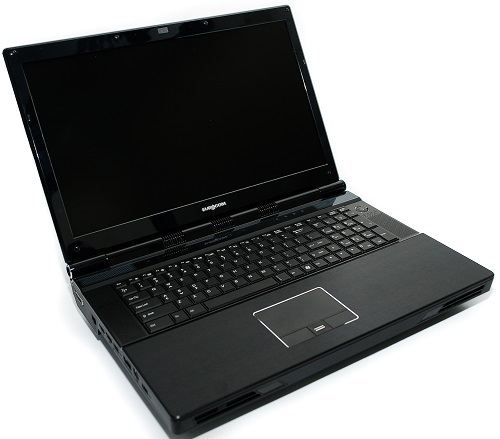 Unlike conventional servers the EUROCOM Panther 5.0 Server Edition weighs just 12lbs/5.5kg and is equipped with an integrated keyboard, 17.3” LCD Display, touch pad and Uninterruptable Power Supply (Battery Pack). “The Panther 5.0SE is perfect for organizations that require fast network setup on the go. Companies can have an entire network server, for 20-50 users, running in one box. We also have customers who use our mobile servers as backup in case their production server goes down, they can load the virtual machine on to the mobile server for production purposes while the main production server is down” Mark Bialic. Fast deployment, right out of the box, combined with easy relocation and the ability to hand carry the system make the EUROCOM Panther 5.0SE an extremely easy system to travel with while providing server capabilities. A lightweight design of only 12lbs, while being only 2.4 inches/6cm thick makes the Panther 5.0 server easy for on-the-go deployment. In environments where space, weight, mobility, and energy bottlenecks don’t exist, rack mount and tower servers remain the most cost-effective and highest density options. It addresses emerging needs and opens up new opportunities throughout the market. Up to 32GB of superfast DDR3-1600 SODIMM memory is also supported via four channels. Solid State, Hybrid, or Enterprise level drives with RAID capability are supported in the Panther. With support for up to four 1 terabyte storage drives, the Panther is able to offer 4 terabytes of storage. RAID 0,1,5,10 capability gives users the ultimate in performance or redundancy. III. SATA 3 (6 Gb/s) storage. Up to four 2.5” Enterprise Class SSD drives in RAID 0/1/5/10 for up to 4 terabytes of storage. VI. 1 Gigabit LAN on-board, second network adaptor available through ExpressCard/ 34 slot; fiber optics available via ExpressCard 54 slot; Quad Port Ethernet Adapter available via ExpressCard/34 and MagmaBox.